It’s been 30 years since they last appeared – and won – but South Korea looks a good chance for the title. South Korea appeared in Williamsport like a comet, seemingly came out of nowhere and shone for two years. And just like that, it was gone. The Koreans are returning again to the Little League World Series following a 29-year absence. After romping through the Asia-Pacific Region with a perfect 6-0 record, the Little Leaguers from Seoul will now get a chance to defend their country’s perfect record in Williamsport. The Asia-Pacific Region (formerly the Far East) has long been dominated by Taiwan and Japan, who between them have accounted for 47 of the region’s 52 appearances in the Little League World Series before Japan split off in 2007 with its own automatic entry. Since that split, Taiwan had claimed six of seven regional titles until this year. South Korea broke through the Taiwan-Japan stranglehold in 1984-85, claiming the Far East Region in back-to-back years and then winning the country’s only two Little League World Series titles by going 3-0 in each of those two years in Williamsport. That generation of Little Leaguers helped to cement interest in baseball in South Korea, at a time when the country’s professional league – founded in 1982 – was still in its infancy. They came of age a decade later, as Chan Ho Park became the first Korean-born player to appear in Major League Baseball, for a time becoming the ace pitcher of the Los Angeles Dodgers. South Korea also became a force in international baseball, winning the final gold medal awarded in baseball at the 2008 Beijing Olympics after earning a bronze in Sydney in 2000. The Koreans finished third in the inaugural World Baseball Classic in 2006 and were runners-up to Japan in 2009. While the Korean adult teams achieved worldwide success, their youth squads struggled for nearly three decades against regional rivals Taiwan and Japan for qualification to represent Asia-Pacific in Williamsport. 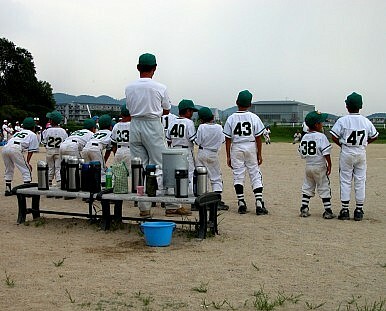 Between 1962, when Little League first invited non-North American teams to participate, and 2013, either Taiwan (29 times) or Japan (18) was the regional representative every year except on five occasions: The two appearances by South Korea (1984-85), Saipan in 1993, Guam in 2008 and the Philippines in 1992, which was later vacated for using overage players. But South Korea finally broke through this year as its team from Seoul put on an amazing display in winning its six Asia-Pacific Regional games in the Philippines by a 74-2 margin. Its closest victory was a 9-2 win over Taiwan in which it surrendered its only runs in the tournament. The other five were all shutouts. The boys from Seoul will face the Czech Republic in the tournament’s opening game Thursday. In a revamped format, they’ll have to win the double-elimination bracket involving all eight non-U.S. entries before advancing to face the U.S. bracket winner for the championship. Their toughest competition figures to be Japan, which won the international bracket each of the past four years and the World Series championship in three of them. In the past 47 years, teams from Taiwan (17), Japan (9) and South Korea (2) have combined to win more than half of the titles in Williamsport. This year’s Korean representative appears to have an excellent chance of not only extending that dominance, but its country’s perfect record in the Little League World Series. *An earlier version of this piece erroneously called Hyun-Jin Ryu a right-hander. Baseball is slowly catching on Down Under, but faced a setback with the killing of an Australian ballplayer.